First off I hope everyone is enjoying there Thanksgiving weekend. A very nice Saturday is shaping up across Southern New England. High pressure is just off of the North Carolina coast and is responsible for the unseasonably warm November weather. 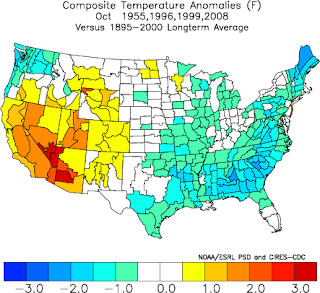 The run of above average weather will continue until the North Atlantic Oscillation reverts to its negative phase. The University of Columbia has made some nice graphics illustrating the effects of the NAO. When the NAO is positive, the pressure gradient between Greenland and the Azores Islands is greater so storms are stronger; the Pressure Gradient Force is on of the most important forces in Atmospheric Science. In the Negative Phase Greenland warms up while the East Coast is prone to more snowy outbreaks. These graphics are slightly outdated and slightly incorrect, but it captures the general idea of the NAO. 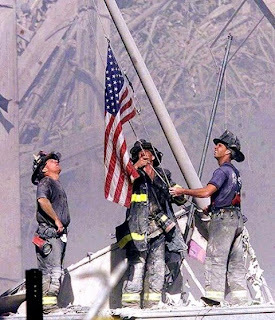 Check out Columbia's webpage here. For virtually all of November the NAO has been positive and it looks like it will continue into early December. The models are not great at pattern recognition; they often break down patterns too quickly. They have been hinting at a flip to the negative phase, but this has yet to happen. The longer the NAO is positive the warmer our weather will be. Here is the Climate Prediction Center forecast through December 1 and beyond. 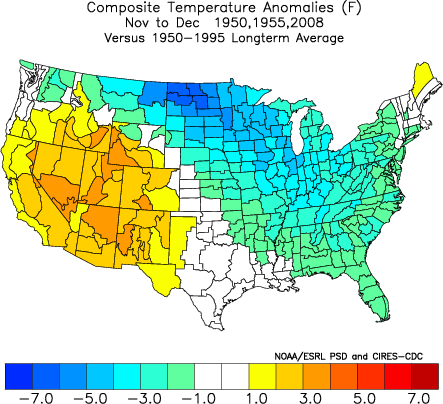 Given that the models wanted to change this pattern for several weeks now, I think winter is coming fast. So with the big picture out of the way, time for the forecast. Today's temperatures will soar into the lower 60's. Tonight a backdoor cold front drops in from the Gulf of Maine and will increase the chances for fog in the area overnight. The front will stall, then lift north as a warm front letting temperatures soar in the mid 60's tomorrow as well. We may approach record values today and/or tomorrow. Increasing cloud cover will allow for overnight lows to be in the upper 40's tomorrow evening. Monday looks to be a decent day, there is a slight chance of a shower late in the day but it will be a mostly cloudy afternoon with highs near 60. By Tuesday a system is going to lift out of the Southeast and head north. It will pass to our west so there is no chance for snow but rain will approach by early evening. The Northbridge-Nipmuc game looks to be ok, but the later playoff games may be impacted by rain. A shift in the timing by 3 hours throws a wrench in this forecast so stay tuned. Wednesday will start off as wet before drying and cooling down later in the afternoon. These are from NOAA's Physical Science Division US Climate Division data maps. 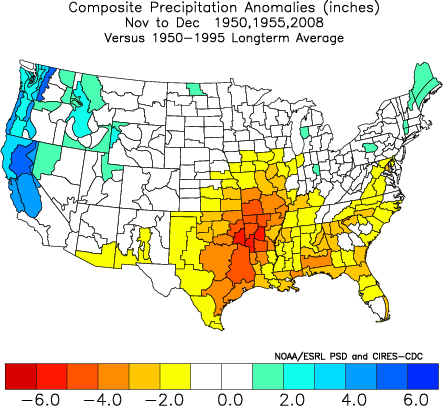 While average temperatures across the analog years were in the 20-30 degree F range, that indicates to me a battle ground for rain and snow in the month. Precipitation looks likely for December so it is going to be a battle to see if cold or warm wins out, especially in the Blackstone Valley. 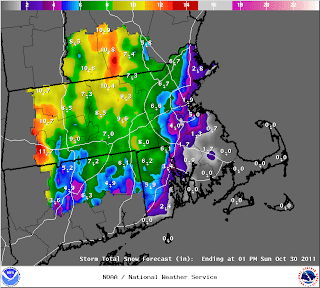 Areas north of Worcester should be mainly snow. A nice weekend is shaping up for everyone. High pressure will keep conditions calm and dry into Tuesday. Tuesday night is when things get interesting as a storm system will lift out of the Midwest and develop a surface low pressure system off the coast. There are two different model camps right now. The American GFS, SREF, and GEFS favor a west to east track and the system would be gone by Wednesday evening, albeit dropping heavy rain for the majority of the overnight and morning hours. The EURO and the NAM are both slower and they result in a phasing of the north and south Jet Streams, giving the storm a north Southwest-Northeast track. This would be later and I feel a greater chance of snow on the backside with this scenario. Its too early to make a call but there is a near certainty for heavy rain. A track closer to the coast is expect because the North Atlantic Oscillation is in its positive phase, meaning low pressure is semi-stationary between Greenland and Iceland. 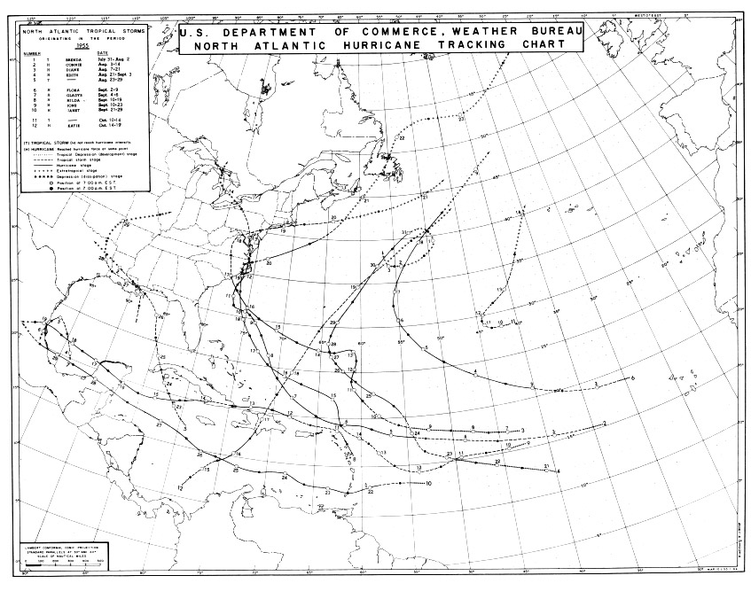 As a result the storm is blocked from taking the classic big snowstorm track. Highs today will crawl into the low 50's, while tomorrow will feature partly cloudy skies and a high near 60. Overnight tonight the temperature will fall to around 40 degrees and it will drop to about 36 degrees tomorrow night. Monday is a typical November day as highs will only reach the upper 40's. Monday Night Football will be chilly, with temperatures dropping into the mid 30's. Fans will be protected by some cloud cover which will prevent radiation cooling. Tuesday looks to be mostly cloudy with highs in the mid 40's. More on the Thanksgiving Eve event as more data comes in. Thanksgiving looks cold, but sunny. At 10 am the temperatures will be in the upper 30's. Stay hydrated! Yesterday's rains are departing as the cold front and low pressure system that brought it exits the coast. However a secondary area of low pressure will develop this afternoon and coat the ground with a few hours of snow, just in time for the evening commute. Most models are in agreement that between 0.20-0.30 of liquid will fall so some areas may see an inch. Most places the roads will be fine, but be aware that the snow will be falling. Friday will be chilly, highs only in the mid 40's with a blustery west wind. The weekend is sunny with highs in the 50's. More detailed post on weekend and next week later today. National Grid has been publicly criticized for its slow response in returning power to the nearly 500,000 people who lost it during the Nor'Easter two weeks ago. I was defending the company; October storms like that are rarely seen. I think the state is wasting money, time, and resources investigating what happened. They will probably find that the crews worked as hard and as fast as they could to restore power but the damage was too extensive for everyone to have their power back right away. That's okay, we are an impatient society that wants everything done for us RIGHT NOW! What's not okay is blaming the weather forecast for the slow response. Here is the story from WBZ. THE POTENTIAL FOR SIGNIFICANT TREE DAMAGE/POWER OUTAGES. A bigger question is why we need to blame everyone for everything. Sometimes s&@! happens. As meteorologists we get things wrong sometimes everyone knows that and everyone loves to point that out. However, this was not one of those times. We were on the ball with this forecast from start to finish. National Grid would have had more sympathy with the public if they had simply said "Sorry, it was a historic storm." Now they look like fools. I hope you all enjoyed our Indian Summer afternoon. Indian Summer is defined as a day with temperatures above 70 degrees after the first freeze. How about 70 degrees after our first snowstorm? We have received zero precipitation since the Snow-tober Nor'Easter. That run will continue into tomorrow before breaking on Thursday. A warm front moved northward and helped steer high pressure offshore, bringing a southwesterly flow to Southern New England. This is the easy part of the forecast because a combination of Tropical Storm Sean and an approaching cold front will spawn a low pressure system that will track through Southern New England. Model Guidance is not in agreement in regards to Sean as the system is forecast to stall. 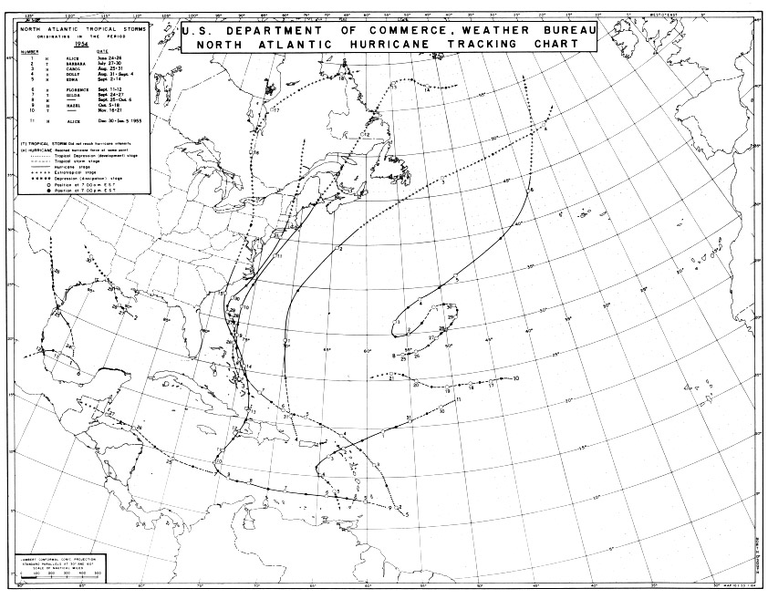 The official National Hurricane Center track curves the storm around Bermuda. The short range North American Model (NAM) sends the storm into Nova Scotia, spawning a heavy Predecessor Rain Event (PRE) Thursday afternoon. A PRE occurs because of the warm tropical air being pulled north over a colder air mass. This rain is supported by mid level energy. This will happen either way, but if the NAM is right the rain will be much heavier. The long range GFS and the GEFS (which has many members and averages the solutions together) develop a secondary low south of Long Island, turning Sean out to sea. This would led to less rain here in Southern New England. 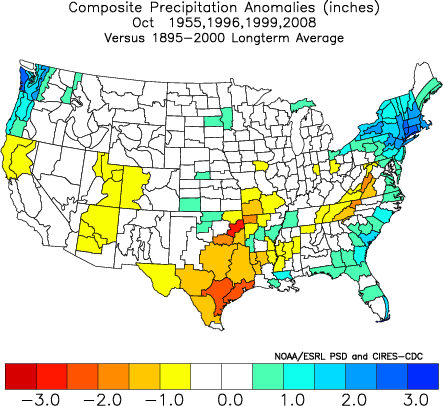 The SREF (another multi-member model) likes between 0.25-0.50 inches of rain. This is a good compromise and its what I expect from this storm right now. Tomorrow I will outline amounts as hopefully some agreement occurs between the NAM and the rest of the model suite. The weekend will be dry as high pressure builds in. Another cold front will approach next week but temperatures will be above average for November, with the exception of Friday/Saturday. So tomorrow is nice, temperatures will again climb into the mid 60's. Some showers may break out overnight Wednesday. The heaviest moisture will occur Thursday afternoon. Highs will be in the low 60's on Thursday. Windy but dry conditions move in behind the system and temperatures will be in the upper 40's/low 50's on both Friday and Saturday. The air mass will warm for Sunday and Monday before we may see a cold front next Tuesday. 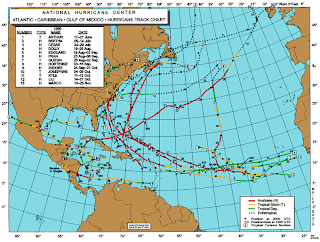 Tropical Storm Sean is the 18th classified system of the 2011 Atlantic Hurricane Season. The season will wrap up on November 30th, but things can form and persist in December. 2011 becomes the 7th season with at least 18 named storms. The others are 1887, 1933, 1969, 1995, 2005, and 2010. This has been an above average season so far, no doubt. 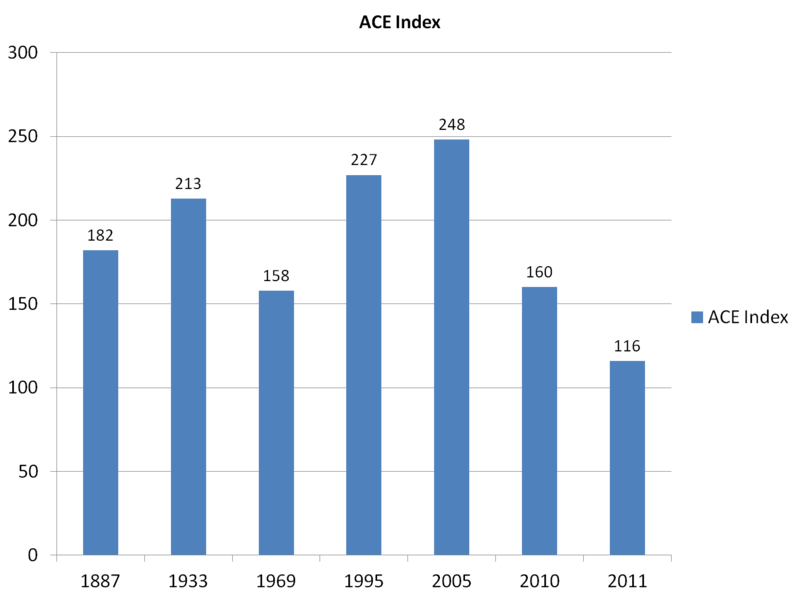 I will have a complete analysis after the season of how 2011 stacks up. 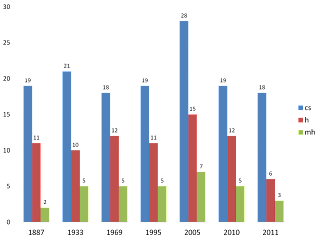 However despite the gaudy classified storm total, 2011 actually doesn't belong in the same sentence as those first six seasons. 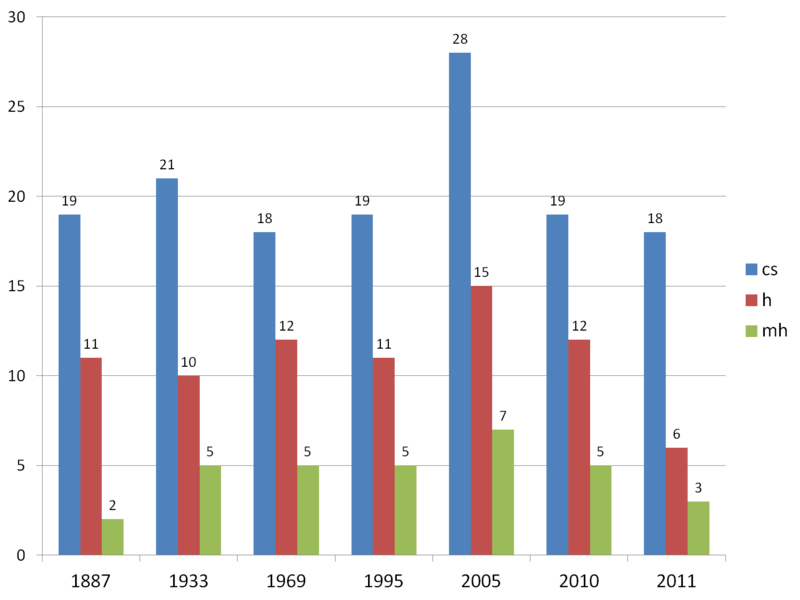 Take a look at these charts I created using data I've collected from the National Hurricane Center. 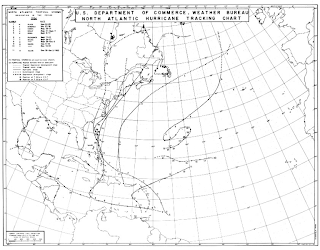 ACE is a measure of the energy released by a named tropical system. 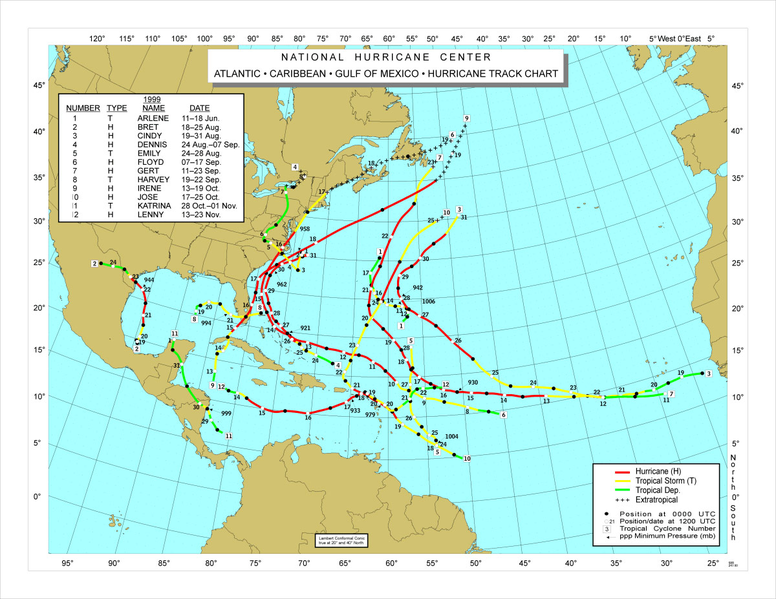 As you can see, 2011 has a significant less amount of hurricanes and major hurricanes and a much lower ACE. According to Dr. Ryan Maue of Policlimate, global tropical cyclone activity is down. With the Pacific Ocean out of its warm phase, perhaps we are signalling a slowdown of this current active Atlantic cycle. 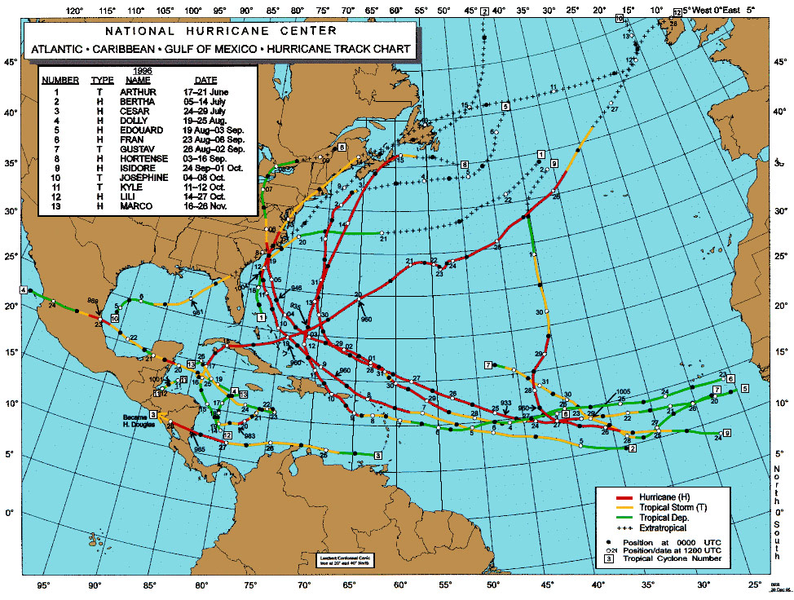 The larger question is why have so many weak tropical systems formed? So far 12 of the 18 classified systems (likely a 19th when post season review is completed) have failed to reach Hurricane strength. The answer, I believe, lies with better detection. I believe several named systems in 2011 would have been unclassified before 2000. Because air flows in a clockwise manner around a high pressure system, our "air" is currently coming from Canada, therefore it is cool and dry. However that high pressure area, currently centered near Toronto, will slide southeast, flipping the north wind to a southwesterly wind. That will allow for temperatures to moderate. As long as the sky cover is mainly clear, I see most places getting into the upper 60's and MAYBE low 70's on Tuesday and Wednesday. We are currently experiencing a positive phase of the North Atlantic Oscillation (NAO), which generally means warmer and wetter conditions in the Eastern United States. What happens is low pressure forms near Greenland/Iceland and becomes stationary, therefore "blocking" storms from travelling off the east coast. Instead, they cut up along the Appalachian Mountains and we see warm temperatures. The next system looks like its going to moving in by Thursday evening; this timing will probably change. A wet event is forecast, due to the mild temperatures and overall pattern. Behind this system things become interesting. As seen above, the NAO is forecast to return to its negative phase. The models also agree, pumping some deep cold into the United States. Looking at the long range GEFS model, one can see deep cold in the Arctic regions. However, models are famous for breaking down patterns too quickly. While we will return to a cold pattern by the end of the month, exactly when this occurs is not settled. I'm going to say that the models have the right idea, they are just a bit quick with the pattern. That means I expect a cold Thanksgiving in the east. So today temperatures will struggle to get to 50. Tomorrow will be warmer, but sunny. Dress warm and stay hydrated if you are going to the Patriots game. By Monday temperatures are beginning to creep back towards 60. Tuesday will be mild for November, temperatures in the mid 60's. I like Wednesday or Thursday to approach 70 before the rain system moves in. Overnight lows will be moderating over the next few days. Tonight will be in the upper 20's, tomorrow night upper 30's, before settling in the mid 40's for the next few days. Enjoy the nice November weather, it's not going to last too long! 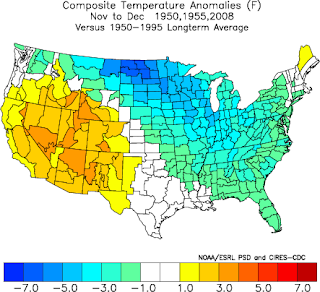 I expect a cold later third of November and December for much of the United States. The projected negative NAO, a ramp of extra-tropical Pacific systems, and a La Nina will cause headaches for many as they try to get ready for the holidays. The most recent analog to December 2011 is December 2008, which is infamous for the Ice Storm (people out of power for 3 weeks) and a pair of systems around December 20th that combined to snow for 46 out of 48 hours in Northbridge. 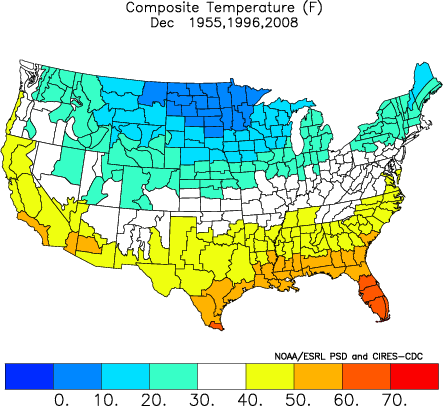 Here are analogs from 1950, 1955, and 2008. These are from the Physical Science Research Division of NOAA. I used the 1950-95 long term average, but the cooling becomes much more pronounced when you look at averages from recent years, (ie 1993-2007 etc; try it yourself here). 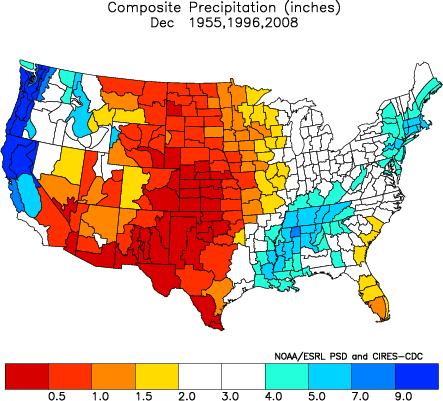 The real interesting question is whether or not El Nino will return in 2012. A neutral state seems likely given a cold PDO; however one can't be ruled out as this La Nina may recharge enough heat that it can be released over the next 8-14 months. How much heat is released or absorbed in the Pacific plays a critical role in climate, whether you want to believe it or not. While its nearly impossible to predict what the NAO will do, I think after it switches to negative it will lock in for a rough early winter. 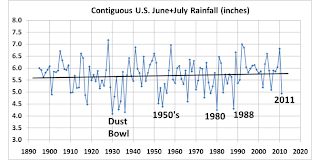 My goal for this blog is to be out in front of things, to have people aware of the general weather pattern. Go Bruins tonight, Pats tomorrow. 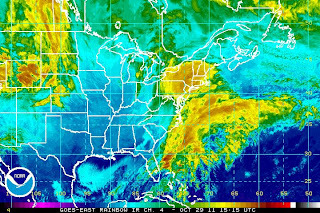 The storm is beginning to come together off the North Carolina coast. Snowfall amounts are verifying above 6 inches for many places in the Mid-Atlantic. Over 44,000 customers have already lost power in these regions. This is what is heading our way. The current temperature in Worcester is 35 degrees. It may not even begin as rain in many areas. Timing has sped up so precipitation will begin to fall between 1-3 PM. The latest guidance has trended every slightly to the east, which will lock in a mainly snow event west I-95. However inside 95 there will be heavy rain and damaging winds, especially across the Cape and Islands. These winds may be in excess of Hurricane force (74 mph +). This storm is unprecedented. I'm starting to think that over a foot of snow is possible in Worcester County. A nice temperature gradient exists just to our east; cold air is already in place. The intensity of the system will also supply cold air. Therefore, a changeover is expect by dusk, but it may occur much sooner. New York City has also turned over to snow much sooner than expected. 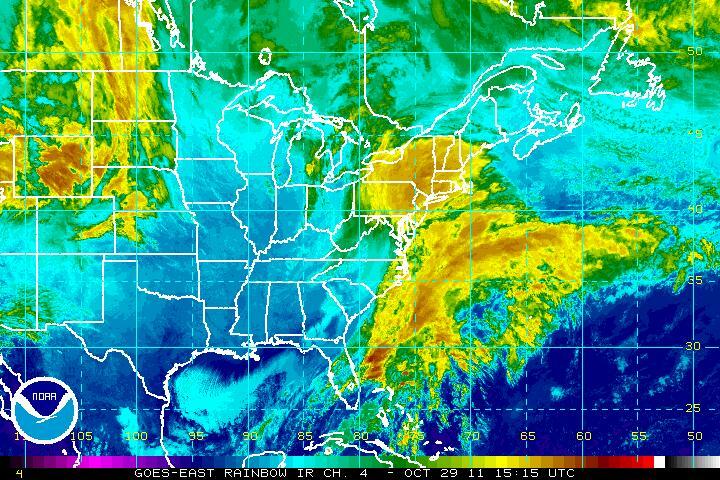 This storm is occurring during a "transition" season (Fall). 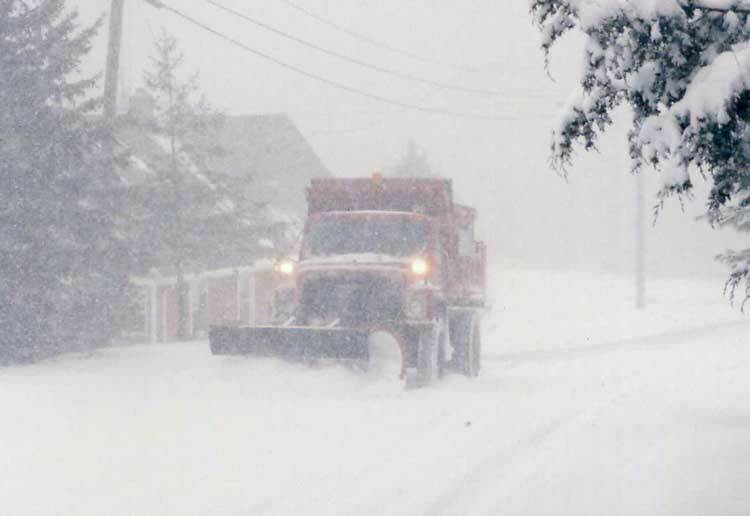 The last major storm to occur during a transition season was the April Fools Blizzard of 1997. Do I expect 3 ft? No I do not but in that storm amounts started off at 4-8 inches, then went up to 8-12, then 12-18 etc. 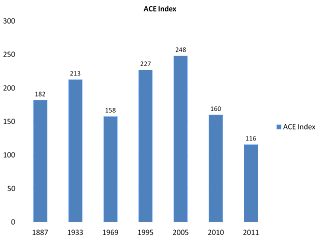 Given the real time data from the storm, I think my totals are underdone. Lets call for 8-14 in Worcester County, 14-20 in the Berkshires, 4-8 for areas north of Bridgewater except for the immediate coast. A low level wind will pick up the warmth of the Atlantic Ocean and keep the immediate coast mainly rain. However inland our wind has much more of a northerly component, so I expect very little rain. Tree damage is expected to be widespread and so will power outages. You might need a battery operated radio to hear the Bruins game tonight. Energy moving across the southeast, ample tropical moisture, and cold air draining into New England are setting the stage for a major October Nor'Easter. Heavy snow and high winds will create near whiteout conditions tomorrow night. We are experience and well seasoned in snowstorms around here, but this is an obvious but critical difference; its October. That means that the leaves are still on the trees which will lead to widespread tree and power line damage across Southern New England. The combination of the leaves, the saturated ground from recent wet weather, high winds, and weakened trees from Irene will cause numerous power outages tomorrow night. We can deal with snow; its going to be difficult dealing with snow with downed trees and power lines. The timing of the storm is terrible. Tomorrow night is a big party night and many people planned to be on the roads. If you must travel (and I would advise against travel) you must take precaution. Bring gloves, a shovel, blankets, and food and water. Snowfall will be coming down at nearly 1-2 inches per hour at the height of the storm. These may last for several hours. 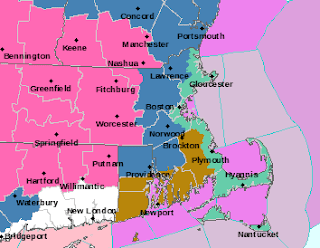 Thus, I am forecasting 6-10 inches of snow for the Blackstone Valley, 8-12 as you head further north and west. Folks down in the Providence to Boston corridor can expect 3-6 inches. The whole event starts as rain. Clouds increase from South to North throughout the day and rain begins to fall between 2-4 PM. The changeover to snow occurs as the sun sets or whenever the precip begins to become heavy, whichever occurs first. Conditions will deteriorate quickly once the changeover occurs. I advise for people to be off the roads by 6 PM. The storms clears out by mid morning Sunday. High winds will rush in behind the storm, so if power is out crews will not get to work until Sunday evening at the earliest. EARLIEST SEASON SNOWSTORM ON RECORD FOR PORTIONS OF THE REGION. Any questions, contact me on Facebook or leave a comment. Blog is Back, So is Snow! 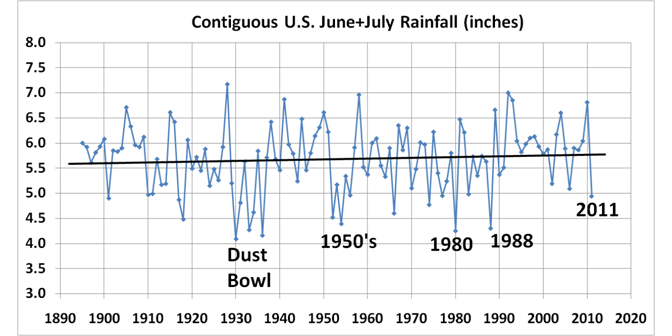 Welcome back to the weather blog! I'm bringing winter with me. Sorry to all of you who dislike the S word, but SNOW is on the way. There are two parts to this story so lets dig in with the current set up. A series of low pressure systems is riding along a stalled boundary just south of New England. The first system brought the clouds and light rain yesterday. Today's system is stronger and is ushering in cold air from Canada. This is setting the stage for tonight's snowfall (from another shortwave) and Saturday night's snowfall. Here is the North American Model (short range) from 8 am this morning for 2 PM. Notice the 0 degree line is north of Worcester. This is a decent indicator of the rain/snow line and Northern Worcester County has begun to change over. The 0 degree line has fallen to the MA/CT/RI border. So the changeover will be occurring. The storm is out of here by about 2 or 3 am so the morning commute shouldn't be too bad. Watch out for some slick spots due to left over slush on the roadways. So now the question is how much snow will fall? North of Worcester I expect a good slug of 2-5 inches of snow. South of Worcester anywhere from 1 to 3 inches. The snow will be heavy at times. The ground is still warm, so its going to take a heavy burst for the snow to accumulate. This same model is indicating that will happen. Tomorrow will feature lots of sunshine, but its only a tease. Temperatures will peak in the mid 40's just like today. This cold air mass will still be in place for Saturday. In fact overnight Friday into Saturday morning will feature low temperatures in the upper 20's for most areas. Saturday morning and early afternoon will be dry, but clouds will increase as an ocean storm approaches. The energy from this storm is current moving through Texas. This energy is partially responsible for the early season Colorado snow as well. The energy will move across the Southeast and a new center will form off the coast of North Carolina. The developing Nor'Easter will increase in strength as it approaches Southern New England. The exact track and ultimate intensity are still to be determined. However, a plowable snow for Southern New England appears to be on its way. The event will begin as rain and then transition to snow. Here is the "Dominant Precipitation type" forecast for Sunday Morning at 8 am.. Sorry for the lack updates during the height of the storm. I've been without power since 9 am on Sunday. I am over my brothers place now. Many have said Irene was no big deal. 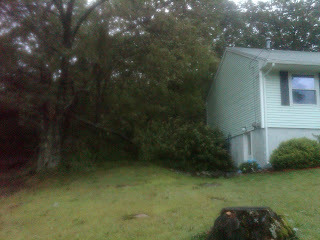 If you still have power, no tree damage on your property, and no serious flooding then yes I agree, Irene was no big deal to you. 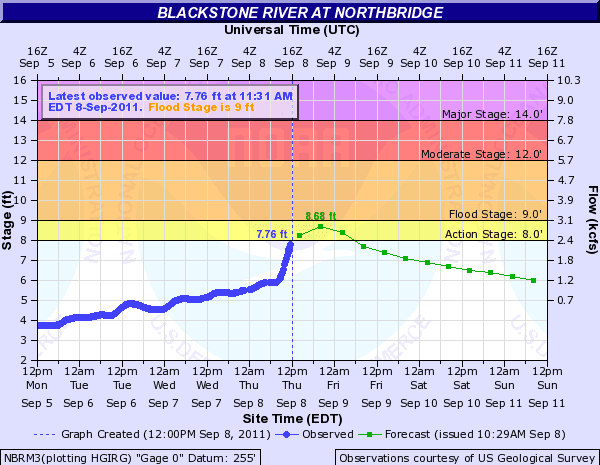 However hundreds of thousands are still without power and floodwater's are only slowly starting to recede in VT. It may a week before power returns in communities like Marlboro, Northboro, Southboro, Mendon, Upton, Uxbridge, Blackstone, Millville, and Northbridge. 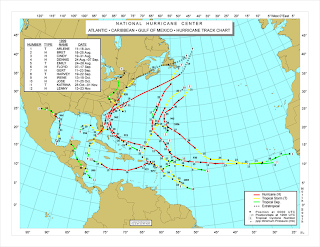 Was Irene as bad as it could have been? No it wasn't because there was very little in the terms of structural damage. 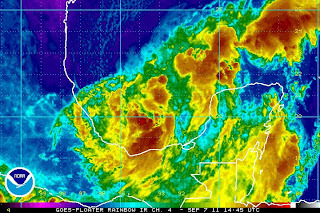 Irene spread it effects out over a large area. It will go down as a memorable storm, probably worse than Bob in Central and Western New England. In all 35 people are dead. The national media coverage has been criticized about how they handled the storm. Many people who are criticizing have no damage on their property. Was the coverage a bit over the top? Yes it was. The Weather Channel did not have a meteorologist in New England. Many focused on the potential destruction of NYC by storm surge flooding. It was clear by Thursday night that Irene did not have the wind speeds to cause that type of destruction. 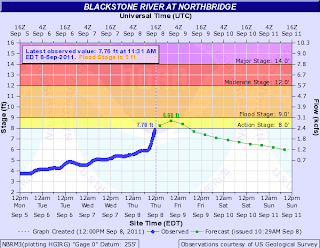 It was also clear that flooding was going to be a major issue west of the storm track. 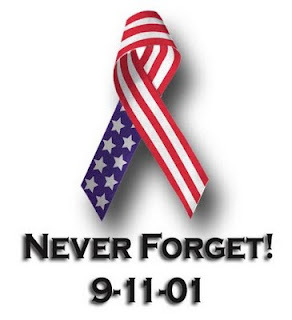 I do not believe residents of VT and upstate New York were properly warned. 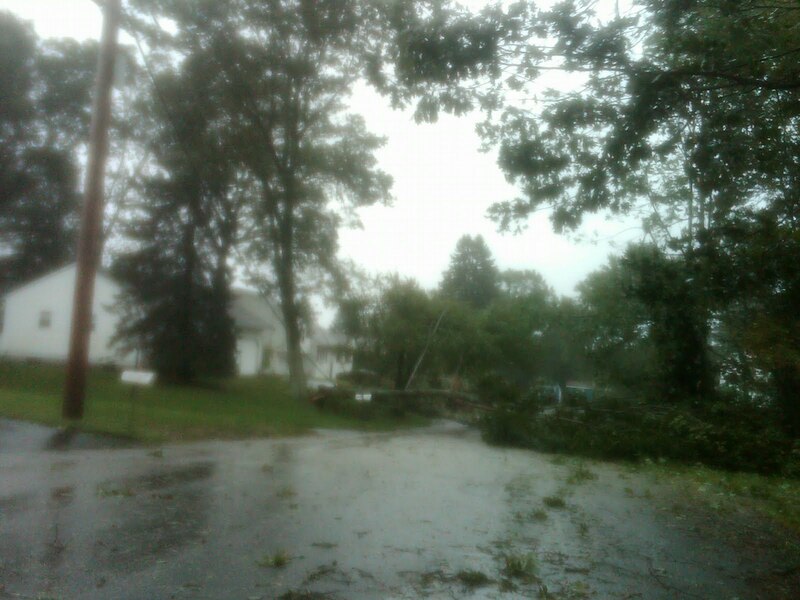 I also believe that residents let their guard down when Irene was downgraded to Tropical Storm. For New England that meant absolutely nothing; the large wind field was still going to knock down trees and power lines. I missed on the landfall wind speed of Irene and my track was off a few miles. All in all I am satisfied with my forecast, but I learned some lessons from forecasting Irene as well. This was the first time I made a public forecast for a Hurricane. If there is a lesson to be learned from Irene it is that a storm with a large wind field will have large impacts. Just imagine the damage if we took a direct Hurricane hit. So whats next in the tropics? Tropical Storm Katia has formed in the deep Atlantic. 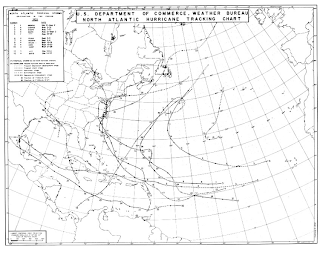 The same general pattern is in place across the Atlantic. Katia should track north of the islands and then re-curve in between the east coast and Bermuda. 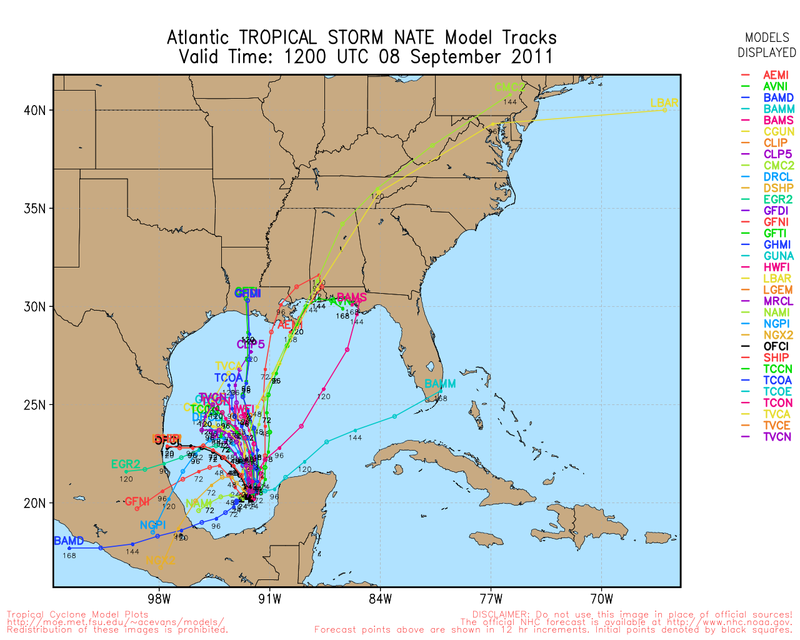 Way to early to be sure where exactly she will go but I will leave you a few maps from past Hurricane seasons that are similar to 2011. All of these seasons have multiple east coast tracks. They also all have re-curving Hurricanes out to sea. So Katia will be monitored. Areas in Texas may get relief from tropical system this weekend. 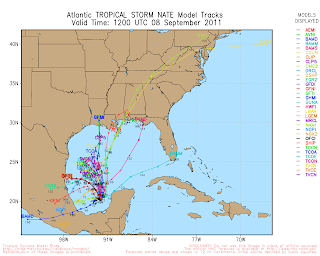 This storm will be named Lee and it could be a Hurricane when it strikes Texas or Louisiana. We are in the height of Hurricane season. New England Weather is pleasant until at least Sunday.